I’m not much of a fruit beer drinker. In fact, I think have may have been avoiding fruit beers for a few years. Well, because one of the major factors that set me on my path to beer enlightenment is the ability of expert brewers to create such a vast array of flavours from essentially the same four key ingredients: water, grain, hops and yeast. Within those parameters they can conjure up pineapple, grapefruit, lime, lemon, mango, banana, apple and so much more – so why introduce actual fruit to the mix? It’s for that reason that I haven’t drunk much kriek. That, and the fact that, er, cherry beer just seems like a bit of a girl’s drink doesn’t it? As I’ve learnt more about lambic and gueze, I’ve realised that fruit definitely has a role to play. And what a way to introduce kriek into my life it is. 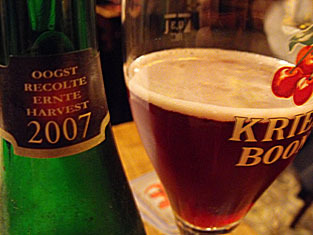 This 2007 Boon Oude Kriek Mariage Parfait is unbelievably good. It might even be better than the 2007 Geuze Mariage Parfait that so defined my last trip to Bruges. A flash of intense lipstick red illuminates the room as I pour. The cherry hit on the nose I’m expecting doesn’t come. Cherry aromas are barely detectable. I’ve been told it’s better to drink krieks fairly young. I may have made a mistake going for the 2007. As the liquid passes my lips those fears are allayed. It’s like silky smooth version of Geuze Mariage Parfait, with none of the intense acid spikes of that beer. Christ, it might actually be better! Then, as it leaves your mouth, it rains cherries. Not a brutal storm, more a refreshing spring shower that has you tilting your face to the heavens to behold its true glory. 't Brugs Beertje is possibly the friendliest beer destination in the world. It doesn’t quite have the je ne sais quoi of De Garre, but the welcoming warmth more than makes up for that. The service is simply outstanding. And it has one of the best beer lists in Europe, if not on the planet. You can just sit and read it for hours, absorbing its glory. 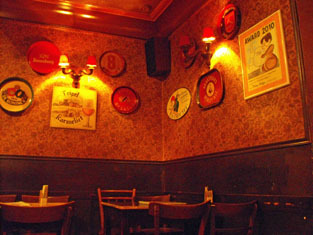 The decor is charming without being twee, interspersed with appealing beer memorabilia. This is the last night of my Belgium trip. The highlight has undoubtedly been the Cantillon Public Brewing Session, but this day spent in Bruges has been fantastic, and confirmed just how much I love this special city. Did I mention I came to Belgium by myself to drink beer? Some people find that a bit weird. I have friends (honest), I have a fiancé (no lie), but I came here alone. I thoroughly enjoy the company of others, but like the solitude that solo adventures can bring. Luckily for me, the aforementioned fiancé is beyond saintly in her understanding of this. Equally, I have no qualms about drinking alone. I’m hoping that doesn’t make me some kind of social pariah. It gives me time to think and slows my hyperactive mind down. These moments are deeply meditative for me. I appreciate the gentle murmur of voices around me, but don’t require any interaction. Just me and Boon Oude Kriek Mariage Parfait, enabling me to give it the appreciation, concentration of thought and respect it deserves. Allowing me to give it the undivided attention that recognises the labour and imagination that has gone into its conception. It’s an almost spiritual connection. Goodbye Bruges. Goodbye Belgium. Until next time.